A technological revolution that delivers ultimate driving comfort. Hürlimann XS/XV tractors are revolutionising both road driving and travel between rows of plants. This is thanks to their individual and exclusive properties, such as an independent front suspension, which increases stability and safety on all terrains. Their extremely compact dimensions may come as a surprise, but in fact allow them to operate effectively in vineyards and on fruit plantations where space is at a premium. This is all made possible thanks to the special geometry of the front support, which reduces the turning radius to just 3 m. Intelligently conceived technology with the FARMotion engines and the GS version with hydraulic reverse shuttle, Stop&Go and ComfortClutch. The LS version with a mechanical reverse shuttle is, however, just as efficient. 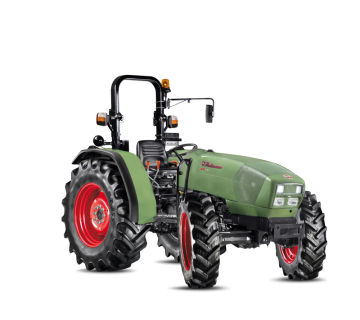 All the hydraulic and electronic components on these tractors work together to offer unrivalled control and stability. Contours with no sharp edges to guarantee a compact and clean structure. A driver's cab of compact dimensions helps prevent damage to vegetation when driving between rows of plants. Comfort is guaranteed on board the XS/XV tractors, reinforced by the quality of the materials used for sound insulation and vibration reduction inside the cab, which ensure a high degree of comfort and convenience in daily work. Resilient engines, available with high torque for working between rows of plants on fruit plantations and in vineyards, with sprayers and tillers, always ready for action with efficient consumption. Common rail, seven-hole fuel injectors and a new intake manifold design improve airflow and optimise combustion to ensure optimum performance at all engine speeds. To comply with the regulations of the Stage III B exhaust emissions standard, FARMotion engines come with an electronic exhaust gas recirculation system (EGR) and a DOC catalytic converter. There is also an option of saving an engine speed. With five gears as standard and the transmission's ECO function, on-road travel is possible at 40 km/h with an economical engine speed. When carrying out tasks such as working between rows of plants, the 30+15 gear transmission, as well as the three-stage PowerShift transmission (45+45) – also with creeper gear – make it possible to adjust the speed to sudden load changes at any time, keeping everything on track and reducing consumption. Direction of travel reversal with the mechanical shuttle (LS version) or hydraulic reverse shuttle (GS version) with Stop&Go and ComfortClutch, PTO output shaft with three or four speeds – 540/540ECO/1000/1000ECO – and ground speed PTO. Optimum power transfer to the ground thanks to automatic control of the front wheel drive and the differential gears, as well as reduced braking distances thanks to the braking system that employs oil-bath brake discs on all four wheels. 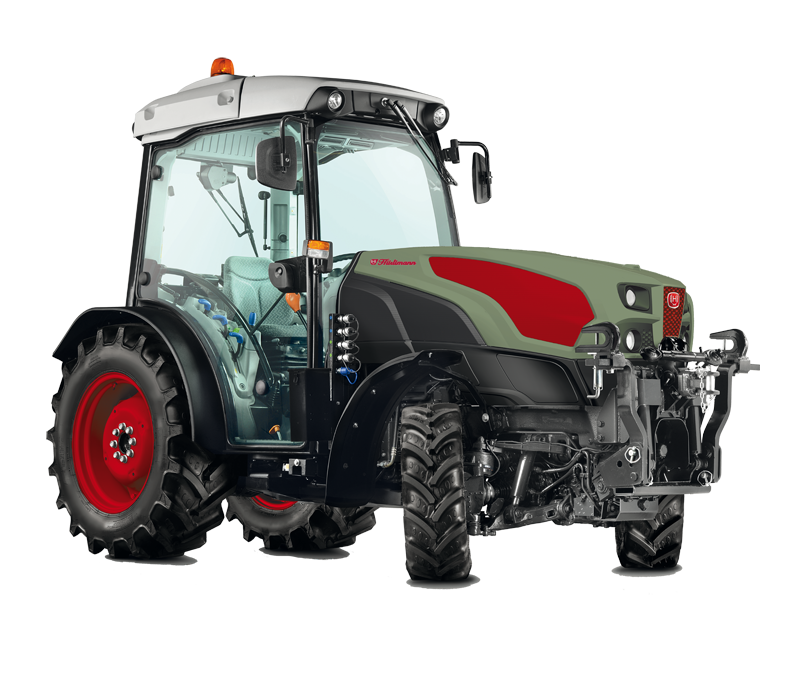 XS/XV tractors have a hydraulic system with a single pump (or tandem pump) with delivery capacity of up to 64 l/min. This is essential when working between rows of plants using additional distributors that are designed specifically for specialised machinery of this kind. A total of up to three additional mechanical distributors with a flow regulator or three mechanical distributors with the option to use two additional distributors that are duplicated from the rear. The rear power lift, which is operated mechanically as standard, can optionally also be equipped with an electronic control system (EHR). The maximum lift capacity is 2,600 kg. The short wheelbase and unique shape of the front support enable a steering angle of up to 60°. The optional air conditioning system ensures a pleasant working environment inside the cab when temperatures increase during summer. When working with crop protection agents, additional activated carbon filters are available for further protection. 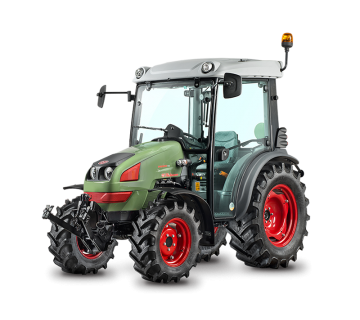 Two platform sizes are available for the XS version: A wider option for 28'' tyres and a narrower version for 20'' tyres, which also allows use of 24'' tyres for a low machine that still offers plenty of interior space. All control elements are ergonomic and easy to identify. The large windows guarantee excellent visibility in all directions. A cab with a 20'' platform is available for the XV models. This model is the absolute lowest and narrowest in the entire range, offering truly exceptional manoeuvrability and versatility.